I have discovered a new photography challenge! Nancy Merrill Photography hosts the Photo a Week Challenge. This week’s theme is wood. These photos show how wood is incorporated into our leisure experiences. This first photo shows how an outdoor, outlet shopping mall in San Diego has incorporated nature into its architecture and surroundings. 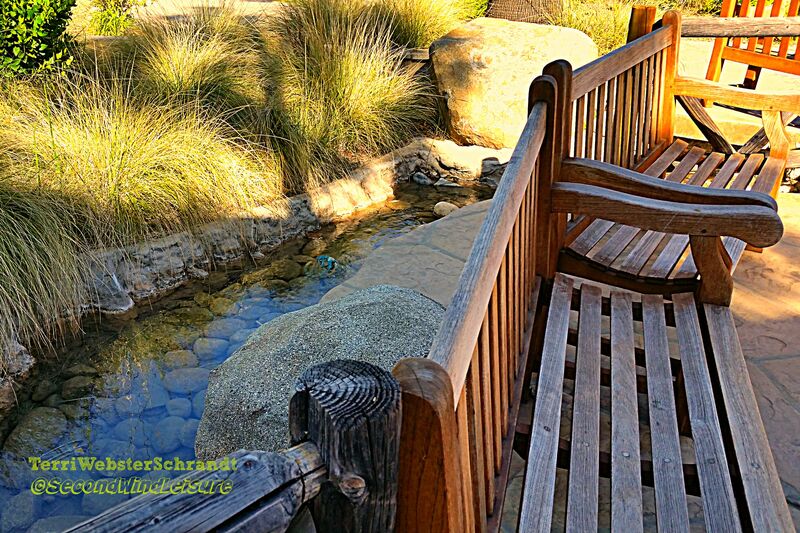 Sponsored by an Indian casino, shoppers are greeted with sounds of trickling water, restful places to sit and rest on these comfortable wooden benches, while listening to Native American flutes and soft music. This photo shows one of my students carefully negotiating the wooden catwalk challenge at the Peak Adventures Ropes Challenge Course. She is over 40 feet high in the air! Especially loved the third shot Terri! Nice perspective. And the second shot made the bottom of my feet tingle, a sensation I get whenever I am reminded of my fear of heights! I adore your last photo of the tree and roots. Great images. Perfect for the challenge. Thanks for joining!